The first poll of 2015. Conducted on Monday and Tuesday. Posted in Misc and tagged poll at 11:36 am on January 14, 2015 by Admin. 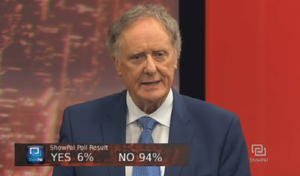 The same polling company that the Sindo uses? No. It’s a Red C one. Probably being stupid but where do these polls take place exactly? Random phone calls to the electorate. I actually took part in this poll, got called up yesterday. From an NI number though, no idea what that was about?! ‘Bout ye. Tell us which shower of Taigs ye’ll be votin’ for in yon Free State election, missus. 21% for Sinn Fein? WTF?! Were the polls taken at one of their offices? Contrarianism goes a long way, apparently. Never EVER been asked in one of these polls and if somebody did ask me. I wouldn’t tell them who I would vote for. 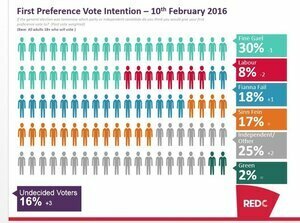 By the looks of it, the next SF, FF, Lab, Greens + Independents government won’t make its term as its likely to have a dozen + self interested independents that will walk out of government at the drop of a hat. I was once polled in one of these. Leading questions to return desired answers. I was asked if the revelations of Bertie’s dodgy dealings were likely to change my opinion on voting for him. As I was never going to vote for him the answer was no meaning they could go back to FFail and say that Bertie’s dodgy dealings were having no impact on their vote. Oh Paddy -you so crazy! Shinners down. Well, that’s good news. It never ceases to amaze me when people express amazement at this – we have the fastest growing economy in the EU, FG are doing a good job (mostly). Shhhh! You’ll get lynched for that kinda talk! im so worried for the future of our country.. its in ribbons now, and goin by this, looks like power will just shift from joker to joker, everyone gettin a pop at it. What’s the margin of error?